So I was searching the newspapers of genealogybank.com for the name “Hammerand” because a woman from St. Louis by the name of Emilie Hammerand was arrested in Vienna in 1934 after the Nazi assassination of Englebert Dollfuss, the Austrian prime minister. She, the wife of an Austrian who owned Vienna’s Hotel Hammerand, was charged with transporting messages between Munich Nazis and Austrian Nazis. How, I wondered, did this American woman end up assisting the Nazis? The last sentence popped open my eyes. 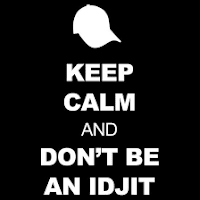 It has been decades since I last heard the word “idjit.” I remember saying it when I was a kid, likely in elementary school, and we called each other idjits. I thought we had made up the word ourselves, so I was amazed to find it in an article written in 1887. Clearly the word had been around a long time before we used it on the playgrounds of Jefferson Elementary School. 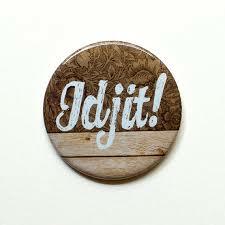 An academic blog entry explained the origin and use of the word in Ireland: https://stancarey.wordpress.com/2011/07/22/ijit-idjit-eejit-idiot/ If I looked hard enough, I am sure I could find a doctoral dissertation written about the word. 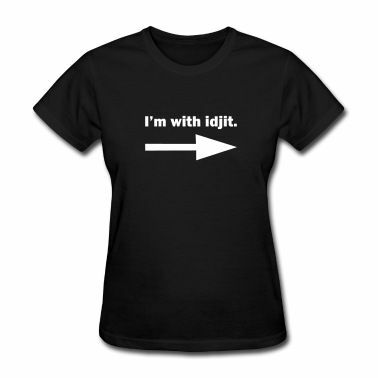 Even though I had not heard the word in many decades, the word has continued in circulation. 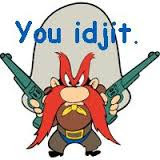 Among its famous uses, Yosemite Sam called Bugs Bunny an idgit in a 1960s cartoon. And in recent years, Bobby, a red-neckish baseball-hat wearing character in Supernatural, a television show, often called Sam and Dean, younger characters in the show, idjits. 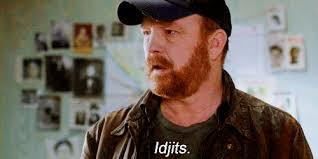 As a result, the word has become a minor meme among the Supernatural crowd, and it is displayed on tee shirts, baseball caps, bracelets, etc. It was fun to rediscover this word after so many years and to learn not only that it survived a journey from Ireland but also that its longevity extends well over a century. If I were to write an updated definition of the word, I would illustrate it with a picture of Mrs. Emilie Hammerand of St. Louis, a friend of Austrian Nazis, who, most assuredly, was not left handed. One of the unaccountable peculiarities of our good friend, Mr. David Sills, is that he is left-handed all over. Not only does his left side boss all the balance of his anatomy, but it controls and directs his walk, his conversation and his tobacco. In fact, when he saunters down the street the most casual observer can see at a glance that his entire right side is badly henpecked, and is keeping in the procession with servile timidity. The oldest inhabitant never saw him shove a jack plane with his right hand, and when he wears a bile it is invariably located to the right of the equator of his backbone. In you mention the stock law his left eye responds with surprising vigor, and his snore is known by neighbors as a strictly one-barrel performance. Mr. Sills is a quiet, unpretentious citizen. He does not carry around an intellectual headlight to dazzle people and make horses run away. But he has a head to defy the power of his eloquent hammer. And he is left-handed from away back. Not long since Dr. Durham, in a laudable pursuit of science, questioned Mr. Sills in reference to this peculiarity. Mr. Sills replied that he was not built that way at the start, or a little earlier, and that he was vaccinated when quiet young with a left-handed scab, and it stuck. Then he solemnly informed the doctor that this world has never seen a bald-headed idjit or a left-handed fool. In this Mr. Sills is eminently correct. Someone asked me once if there were any digits around Birch Bay. I guess I misunderstood. I held up both hands, waved my fingers and said I had ten. Right, Pat. Fortunately, most of the idgits abandon Birch Bay during the winter months. Wait, maybe those of us staying here are the idjits, given the crazy wind and the cold that keeps freezing my digits.